Walking off Sunset, I'd turned onto Wilcox when I saw it. A dollar! 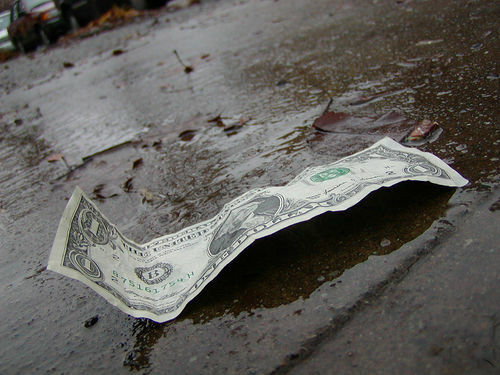 A shiny new dollar...pristine, unclaimed, on the ground waiting for me. Few feelings match the joy of found money, money without work involved, strings attached, or responsibility quick to follow. Found money is what dreams are made of because with it you can buy the frivolous: french fries, candy, a hat for a dog! It doesn't matter what you choose. What matters is that it's unexpected, and it's your responsibility to immediately celebrate your good fortune by trading it for temporary joy. Filled with exultation, and brimming with hope for the future, I bent my knees ready to scoop that tiny green quilt of dreams. Then, just as my fingers grasped the miraculous visage of General Washington, came they horrible voice. "Hey buddy, do you have a dollar?" - a reclining homeless man only a step away. Confused and startled, my defenses were compromised. Clearly I had such an object, denial was implausible. Continuing out of my motion of picking it up, I handed it to the drunkard. I walked onward trying to seek comfort in having done a good thing. Then I'd realized...he'd probably seen it the entire time from his spot on the sidewalk. I wasn't helping a man in need. I was picking up after a guy too lazy to grab money! As my dreams of french fries, candy, and dog hats faded into the ether, I realized I'd traded my the glorious dollar for mere emptiness. That and the hope that some homeless guy would choke at McDonald's.